Chinese President X Jinping in a meeting with his BRICS counterparts said the five countries need to upgrade their economic structures for long-term development. “China stands ready to share development opportunities with other BRICS countries and lift our economic cooperation,” he said at a BRICS leaders’ meeting held in the Turkish resort city of Antalya on the sidelines of a Group of 20 (G20) summit. The leader of the world’s second largest economy met Presidents of Brazil, Russia, South Africa, Dilma Rousseff, Vladimir Putin, Jacob Zuma and the Indian Prime Minister Narendra Modi ahead of the G20 Summit. Xi also warned that the BRICS are facing increasing complexities and difficulties and experiencing slower growth. This year’s G20 summit, the 10th of its kind since 2008, comes as the world economy is still being held back by slow, uneven recovery and shortfalls in demand, investment and infrastructure. 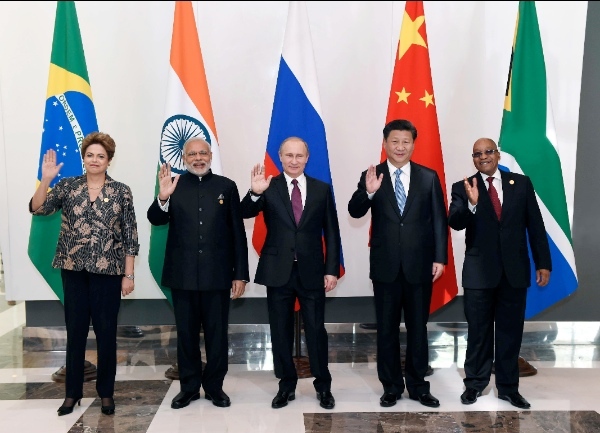 BRICS still contribute to more than half of the global growth today, Xi reminded the critics. “We are still the important engine for the world’s economic growth,” Xi told his BRICS counterparts on Sunday. The Chinese economy expanded 6.9 per cent in the first three quarters of this year, which contributed as high as about one third to the global growth although the third-quarter figure — also 6.9 per cent — posted the lowest reading in six years, according to Chinese officials. Xi, in Turkey, proposed the BRICS members jointly help improve global economic governance by forestalling short-term financial risks within the G20 framework and increasing the representation and voice of developing countries. “We should press ahead with the transition of the G20 mechanism from crisis response to long-term governance,” said Xi. “We need to build an open world economy, oppose trade protectionism, push for the adoption of responsible macroeconomic policies by all G20 members, and jointly expand global demand,” he noted. The president reiterated that the BRICS countries need to help build “a new-type global partnership that is more diversified, open, pragmatic and efficient”. At the BRICS Summit in Russia earlier this year, Xi had urged the BRICS to be confident in their cooperation mechanism within the group, warning against the backdrop of complicated factors facing the bloc, such as the downward pressure on them due to the sluggish global economy, and what he had called “external hype of pessimistic views on the member states’ prospect and doubts over the effectiveness of BRICS cooperation”. Many western analysts have cast aspersions over the prospects of the bloc as global economic recovery remains lacklustre also affecting the BRICS. Meanwhile, in Turkey, the five leaders strongly condemned Friday’s terror attacks in Paris that have left at least 129 dead and 352 injured, and reaffirmed their commitment to international cooperation in combating terrorism. “The international community must join hands to step up counter-terrorism cooperation, in light of the purposes and principles of the UN Charter and other recognized basic norms for international relations,” Xi said. “Both the symptoms and root causes of the issue should be addressed. Double standard shouldn’t be allowed,” he added. As to the refugee crisis in Europe, Xi held that the fundamental solution lies in peace and development. During the meeting, the BRICS leaders pledged to strengthen their strategic partnership and cooperation in the course of carrying out the 2030 Agenda for Sustainable Development, and to safeguard the interests of the emerging economies and developing countries. They also called for early implementation of the 2010 reform plan of the International Monetary Fund. In addition, other BRICS leaders voiced support for China in holding the rotating G20 presidency in 2016. “We are pleased that China takes over the Presidency of G20 in December 2015. We assure China our full support,” Indian Prime Minister Modi told Xi at the meet. BRICS leaders need to do more to protect and safeguard their own peoples. By giving them more security and trust, this can only translate in strength towards their goals. The environmental disaster that happened in Brazil recently is shameful. Whole populations are being left to fend for themselves and the huge multinational companies that caused it are doing absolutely nothing and are getting away with it. SHAME SHAME SHAME!! !